The keyboard comes in a beautifully, well build, solid cardboard board which really gives of the premium look that the board represents. In the box you can find the keyboard itself along with an User documentation, the Unifying receiver or also called a USB dongle to connect to your pc and lastly (I guess, because it was missing in my review sample as you can see in the picture) a USB type A to USB type C charging cable. The keyboard is 43 cm by 15 cm and has a total height, with the crown, of 3,2 cm. The Craft has a fixed inclination, there are no standoffs that you can click out to regulate the inclination angle. But I believe that this shouldn’t be a problem for most people, because it is a rather neutral inclination, not too steep, no to flat, at an angle of about 8 degrees it feels just fine. I myself used to prefer typing on steep angled keyboards at max height, but since I have my laptop I’m used to typing on a flat keyboard and that meant that this keyboard’s fixed height did not pose a problem for me. The keyboard has an on/off switch at the back and a USB type C for charging next to it. On the top left it features the crown, on the top right it has a status LED and there is a proximity sensor in the top bar. The keyboard has a white backlight of which the brightness can be controlled by the F6 – F7 keys by default. The proximity sensor is used to turn of the backlight when your hands are not near the keyboard and turn it back on when your hand are near. This is done to preserve the battery of the Logi Craft, and, because of that, it has a very long battery life, for a backlit, wireless keyboard. I could go a whole week of days with 4 to 5 hours of usage without needing to charge it (with the default backlight brightness). The switches used in the keyboard are nonlinear, it means that they have a fixed actuation distance, they feel very responsive and I could always tell whether I had fully pressed the key, or whether my finger was just resting on it and I wasn’t yet past the actuation point. The keycaps itself are all concave with the top and bottom line of keys as exception (numpad is fully concave). 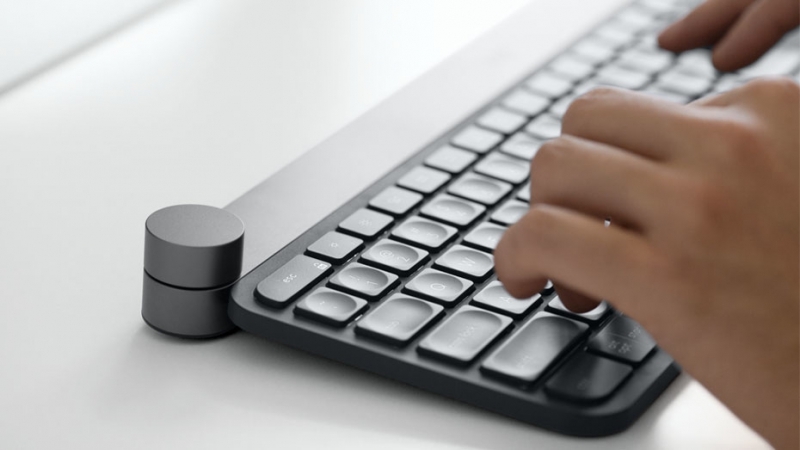 This makes so you don’t miss a key or press the wrong key as easily as on other keyboards. After a few hours the keycaps felt completely natural and I still haven’t miss pressed a key since I started using this keyboard. You can just plug in the Unifying receiver in your computer and it will automatically start the installation process for the needed drivers of the keyboard. Then you can immediately start using the keyboard, the crown will just act as a volume knob and it will turn in clicks. But when you install the Logitech options program, you can program the F – keys and the crown of the keyboard, the crown is still a volume knob as default but now it no longer turns in clicks, its just a free knob. In the Logitech options program you can make profiles for the crown for different programs or download the standard options for programs like Word, Chrome, Firefox, VLC and of course most adobe software programs and professional artist apps. The crown has three input modes; just turning, touching the top and press turning. In Word for example, if you don’t select any text, you can turn to change the theme style, but then if you touch the top you can change what turning the button does, one tap will change it to changing to theme color and you scroll through different colors with the button, the next tap will go to theme font, and on more tap brings you back to the beginning. But then if you select text the options change, you can now choose to change between size, paragraph style and alignment. You can also program what the crown does for a certain program, for example, I added GIMP 2 as program and chose to have to crown to be able to zoom and pressing the crown could copy what I had selected. In the Logitech options program you can also program the 3 buttons dedicated to choosing which device you are connected to. This keyboard is truly a magnificent piece of technology, even thought it costs €200, you can clearly see the effort that was, and still is, put in to make everything work seamlessly together. Working with the crowns is easy and feels as a second nature once you get used to it. This keyboard is a joy to use and I would recommend it to anyone that doesn’t mind spending the money and needs a professional keyboard.